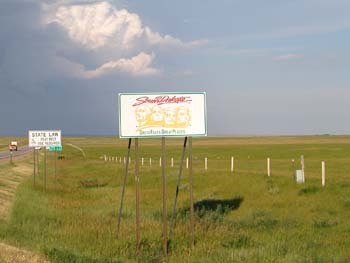 We made it to South Dakota around 6 PM or so. It took us another hour and a half to get to Rapid City. More photos here. We rode the 1880 train round trip between Hill City and Keystone. It takes about 2 hours for that trip. After that we took some photos at a reservoir we passed when we went the wrong direction to Hill City. Along the way, we saw some sign for a cave. Since we didn't have much else planned we decided to visit the Wonderland Cave. The route there was quite an adventure. Once we got there and took the tour, it turned out to be quite interesting. The return trip to Rapid City was a little more direct. It took us through Sturgis although we didn't stop there. Wile we drove along I-90, we could see smoke from what seemed just the other side of the ridge. That turned out to be the Ricco fire. 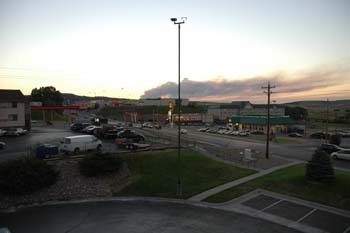 You could see the smoke from the hotel where we stayed. More photos here. This was an all day bus trip adventure. We started out at Reptile Gardens, continued on to Bear Country, Mount Rushmore, Crazy Horse, Iron Mountain Road through Custer National Park, and finally to Pitchfork Fondue where we had a great ribeye steak. Yum! More photos here. Our last day there was rather busy. 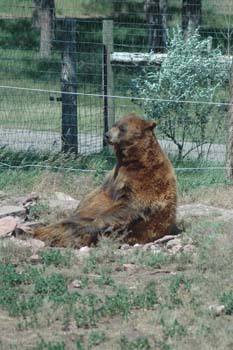 We started out going back to Reptile Gardens and Bear Country. Then around town for a few more photos and supplies for the trip back. 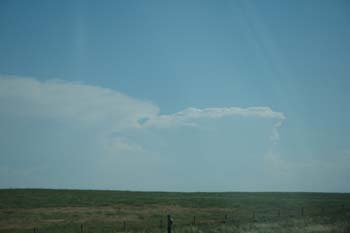 Once we were on the road, I saw this cloud which reminded me of the Crazy Horse monument. Just a few minutes earlier, the cloud near the middle of the photo looked like his face. More photos here.